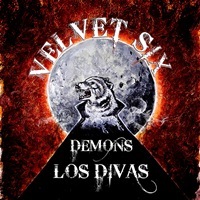 Demons Los Divas is the second album from Finnish band Velvet Six and damn, why didn´t I discover them earlier. Singer Olle Wallenius and his men play very good Goth Rock and have a knack for great songwriting. This becomes clear, at the latest, after listening to the second song, which is also the album´s title track, Demons Los Divas. Catchy riffs, clear lyrics, nice backing choirs and a singer who has just the right portion of dirt in his voice. Speaking of Wallenius´ voice, it´s a very pleasant one, which you really like to listen to and, which is very variable and wont bore you after two sentences. I believe, he could even sing the telephone book and it would still sound awesome. At least on the record, I beg and pray that it sounds live just as great, otherwise it would be a huge disappointment. The songs are arranged in a great way, guitar, drums, bass, keys and vocals are really harmonious. It´s a nice mix of fast and slow songs with lots of feeling. I´m really happy that among the plethora of bands, there are still some surprises to be discovered. If the guys keep on working and maturing, they will have a great chance of becoming the new The 69 Eyes, replacing the old-timers. I can only say one thing: Great album, keep it up, guys!